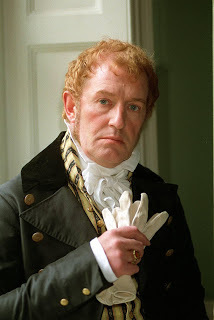 “…It is usual with young ladies to reject the addresses of the man whom they secretly mean to accept, when he first applies for their favour; and that sometimes the refusal is repeated a second or even a third time” (Mr. Collins, Pride and Prejudice). Such silliness is not followed by young Anne Elliot when Frederick Wentworth proposes. But, alas, her family and close friend, Lady Russell, object to her suitor’s lack of noble birth and low funds. Anne is persuaded, partly on their dislike and partly believing it in Wentworth’s favor that he be free to make his way in the world, to rescind her acceptance. So begins a lengthy separation. 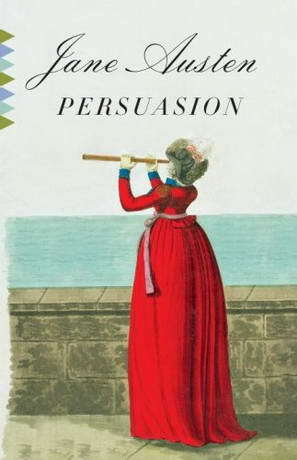 Second to Pride and Prejudice, Persuasion is my favorite of Jane Austen’s novels. Other than a satisfying story of love preserving, the novel is full of excellent characterizations. Who doesn’t know someone like Anne Elliot’s sister, Mary—who, when happy, is quite fun to be around, but when the least little thing goes wrong, is determined to be miserable? Or who hasn’t been the listening ear and the intended mediator between individuals or groups all complaining about each other? On the other hand, I certainly hope you don’t know anyone as vain and self-centered as Sir Walter, and I hope I never have the chance to find out if I could handle heartbreak, illness, and poverty as well as Mrs. Smith. But back to the love story. With so many tales of engaged, or sometimes even married, persons falling in love with someone else (which leaves me wondering how this “love” is different from whatever was felt for the first lover), it is cheering to read a story of a first love withstand opposition and separation. And hopelessness, since there was no thought of reconciliation initially. It’s a very good thing Anne did not succumb to loneliness, or else she might have agreed to marry the insidious Mr. Elliot (I hope Mrs. Clay catches him eventually. They deserve one another.). 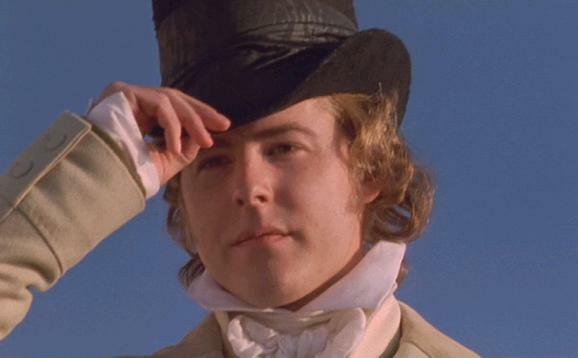 Sneaky looking Mr. Elliot, played by Samuel West (1995). As Anne astutely reasons, it’s not wise to trust someone too controlled, whose tongue never slips. Perhaps an honest outburst every now and then is a good thing for one’s credibility. Many applaud the romance of Captain Wentworth’s letter to Anne that ends all her doubt as to the constancy of his heart, and though it was good, the act that marks him as a great hero in my opinion is the simple, and repeated, act of freeing Anne from discomfort whenever he can. The moment that particularly stands out is when he, though still angry with her, rescues her from her clinging nephew. Note: Jane Austen actually wrote an alternate ending in which Anne goes to the Crofts and finds Captain Wentworth alone instead. If I remember correctly, there was no note between them. I prefer the published ending. You might have noticed I said nothing about whether Anne should have allowed herself to be dissuaded from her first engagement; I leave that topic to you. Should she have married Wentworth then or asked him to wait until he was better established financially? Jaz: Anne Elliot is a full-blown doormat. She takes care of others instead of herself, performs menial tasks and misses evening parties. She’s pretty much invisible; her widowed fop of a father prefers Anne’s two self-absorbed sisters (one of whom is a whiny hypochondriac) to her own company. In other words, she’s an early 19th century version of Cinderella. Only in this story, Prince Charming gets the boot. He isn’t titled, and he doesn’t make anything close to a suitable salary for the daughter of a baronet. Or so say the baronet and Anne’s advisor, Lady Russell. Fast-forward eight years after the fact: Anne is miserable, still invisible, etc. Then Prince Charming (AKA Captain Wentworth) reappears. This is Jane Austen’s last novel, written just shy of a year before her death. It’s so full of regret, second chances and wistful love, it makes me wonder if it’s in any way autobiographical. I’ve seen the two most well-known film adaptations, released in 1995 and 2007. 1995: There were several things I enjoyed about this film. Number one: Captain Wentworth. So rugged, so feeling! Bravo to Ciaran Hinds for this satisfactory interpretation. 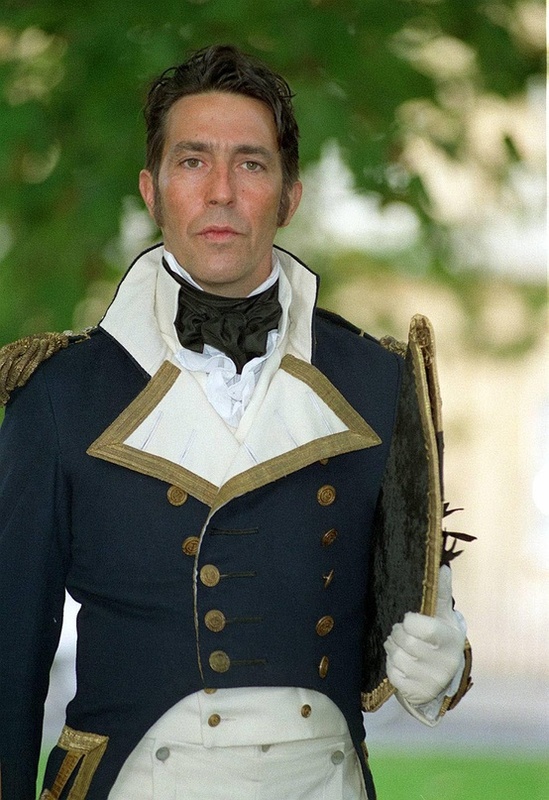 Ciaran Hinds as Captain Wentworth. I also liked the casting and character interpretations for Sir Walter Elliot, the Crofts and Lady Russell. They were true to the novel and believable. Corin Redgrave as Sir Walter Elliot. Suitably vain and foppish. Susan Fleetwood as Lady Russell. I liked her intriguing hats and turbans. One of my favorite scenes in the film is when Anne reads Wentworth’s letter. His voice is full of emotion, as is Anne’s when voiced over his own. But … and I have to say it: the kiss and ending were anticlimactic. Perhaps the director was emphasizing the PDA taboo? Many of the actors, including the heroine, were much plainer and older than described in the novel. 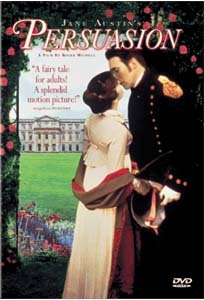 Yes, Austen writes that Anne “lost her bloom.” But so did Marianne Dashwood, and we know for a fact she was far from plain. 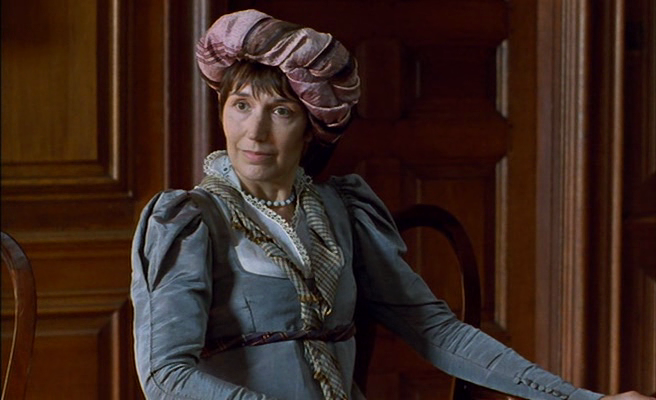 Anne’s character often wore a startled expression when nothing startling was going on. Another thing I’ll point out is that Anne’s family often behave — and sometimes look — like uncouth peasants. Overall, though, this was a well-done, enjoyable film. 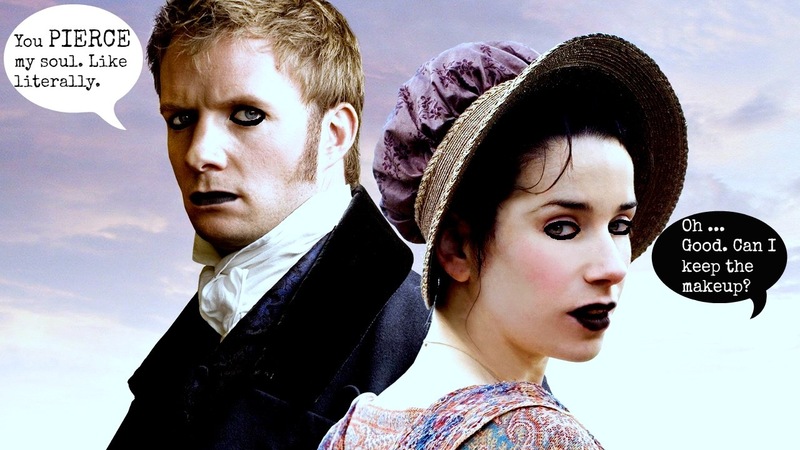 The 2007 version is basically an emo-fied interpretation of Persuasion. Captain Wentworth stood around brooding all the time. He didn’t appear in the least charismatic or outgoing as in the novel. Anne didn’t seem to know how to close her mouth, and near the end she chased after Wentworth all over London and wheezed through her whole conversation with him. Very unlike Anne. And that kiss wins grand prize for Most Awkward On-Screen Kiss of All Time. He took about two minutes to lean over. What does he expect her to do, jump for it? However, the film was more accurate than the 1995 version, and contained beautiful, if rather gloomy, cinematography. This entry was posted in Entertainment by Jasmín. Bookmark the permalink.